Glassblower.Info - Glass Flowers - Molla Tool Corp. In my travels through eBay, I look for unique metal items which are strong enough to withstand the 2000 degree heat of molten glass, and might be used to shape or manipulate the glass. There are relatively few choices - cast iron, steel, and bronze (which is stronger and harder than any other common alloy except steel). 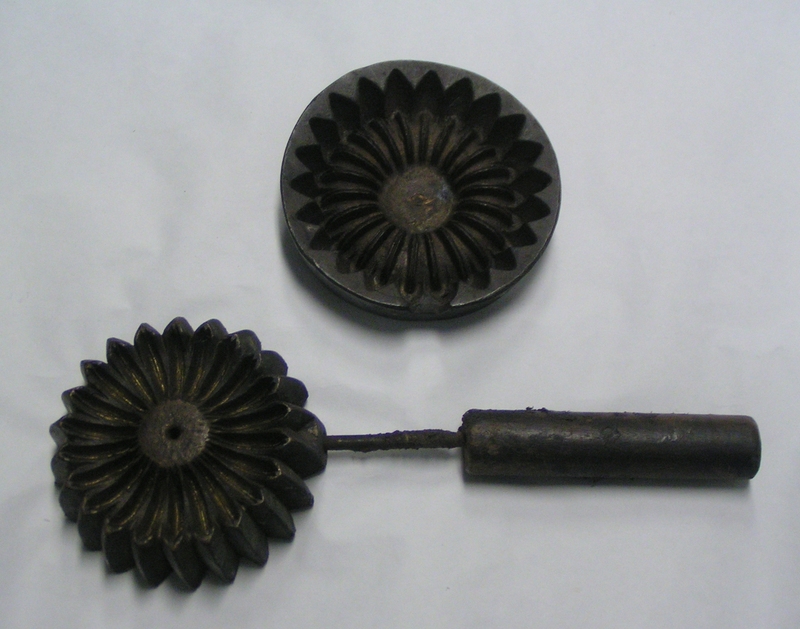 So, on eBay I find this really old antique (1800's - 1930's) bronze flower iron ("silk flower mold"), made by Molla Tool Corp, in New York City. Out of the ten billion (10,000,000,000) web pages in the entire Internet, exactly 4 web pages (in English) contain information about "Molla Tool", which gives you some idea of the rarity of these molds. "These flower irons, which were heated and then pressed together with fabric in-between, were used in the sewing, tailoring, and millinery industries to form those wonderful silk, velvet and felt flowers that graced the garments and decorated the homes of years past." The website www.artroomsgallery.com has this information here and here which names the two partners: "Charles P Molla and Amadeo Arigoni, partners in Artificial Flower Tool Company circa 1800's-1930's." I find it exciting to find an antique tool which has not been used for decades, and give it a new purpose (making glass paperweights), far different than its original function. 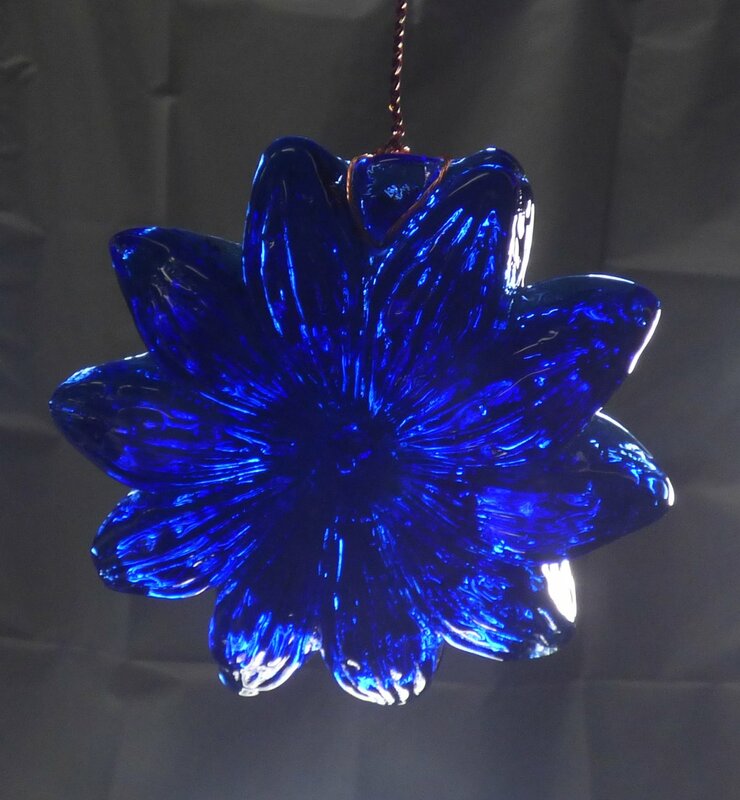 Above is a different flower mold, this one is made out of deep dark rich cobalt blue, stunning with bright light streaming through it. 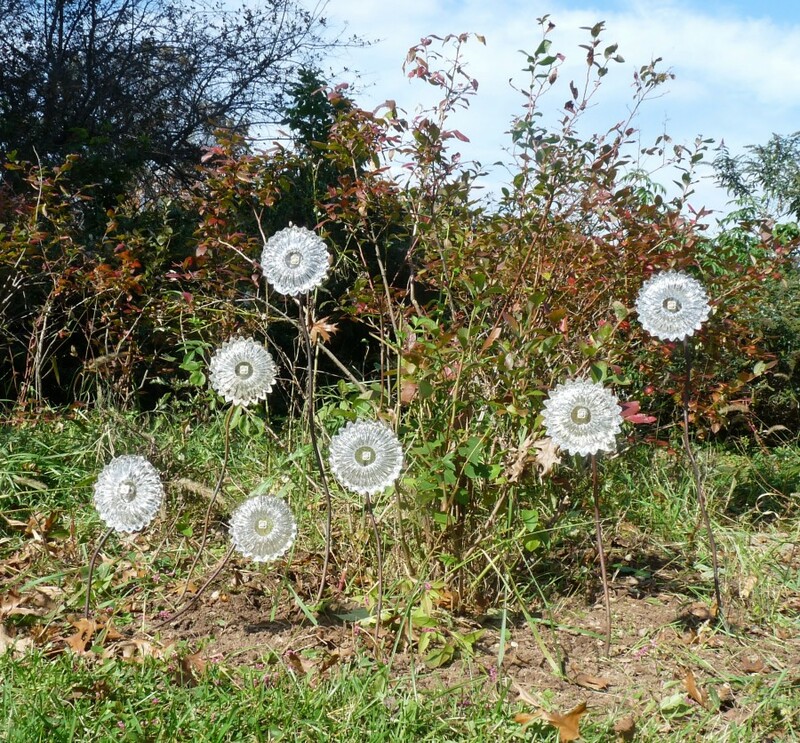 Here is a small group of glass flowers growing in my garden.